Ge-Anne Bolhuis is the Instructional Technology Specialist and Media Specialist Liaison for a Georgia (US) school system. Today, we are talking about Future Ready Schools and Future Ready Librarians. According to their website futureready.org, "Future Ready Schools® helps K-12 public, private, and charter school leaders plan and implement personalized, research-based digital learning strategies so all students can achieve their full potential." Additionally, a Future Ready Librarian is expected to be an instructional leader to help schools become Future Ready. Ge-Anne shares with us her thoughts about the need to have the instructional talents of the librarians used to help teachers implement better practices in the classroom. She shares that building administrators really have to have a better understanding of the role that librarians can play in keeping the school on track. 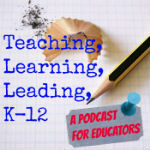 You'll hear us discuss the expectations of a Future Ready Librarian as well as some of the tools that the librarians can use to help drive the school to new levels of success. We also talk about her favorite app - Google Keep and other tools that the Future Ready Librarian can share with the faculty of schools and students. Listen for us to talk about EdCamps and CoffeeEDU meetups, as well. Lots to learn about today.